I’ve got a great little dessert recipe to share with you that is both cute and easy. Trust me, it’s almost impossible to mess this one up. 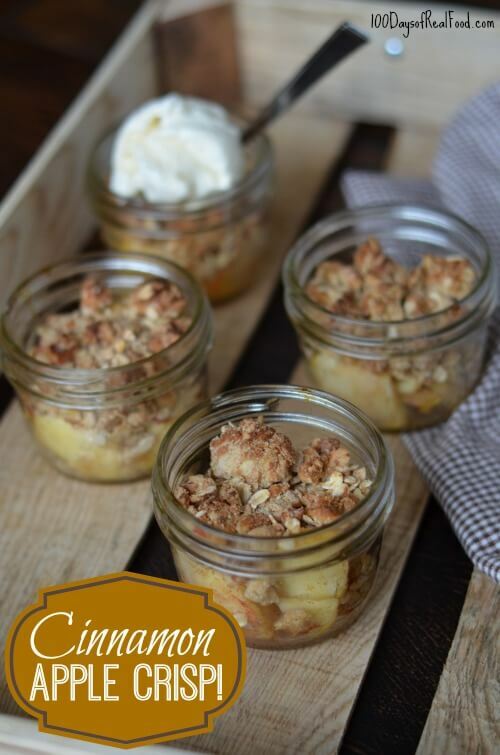 We served this Cinnamon Apple Crisp dessert to our Dinner Club guests last weekend. And since we used up every last minute of prep cooking time (before the guests arrived) working on the appetizers and main dishes, I found myself starting from scratch with this dessert at the end of the night. This was after a long day, and, to top it off, this was a dish I’d never even made before. I usually only serve guests recipes that I know will turn out well, but lately I’ve been more lax in that department for some reason. You just never know when you are going to have a recipe fail! But thankfully I learned it’s hard to screw up apples, butter, sweetener, oats, and nuts all baked together in cute little jars of goodness. Clearly the only reason I wanted to serve this dessert in the first place was for an excuse to buy those jars! Boiled Peanuts: I previously thought this might be a complicated recipe when in fact it’s just peanuts that have been boiled! It does take quite a few hours and you certainly don’t want to forget the salt and other seasonings, but this one is super simple. Organic Pimento Cheese: I used the recipe that’s already on my blog for this appetizer. Local Fried Green Tomatoes: This recipe came out of Joy of Cooking (my cookbook bible). Organic Kale and Apple Salad: Coming to the blog soon! Whole-Wheat Biscuits and Jam: This is another recipe that’s already on my blog. I just made them into a bite-sized version and served with butter and storebought all fruit jam. NC Shrimp and Grits: We went out of our way to ensure we had fresh, local, wild caught shrimp for this dish instead of any questionable seafood shipped in from China! Organic Apple Crisp with Homemade Vanilla Ice Cream: Get this easy crisp recipe below! And for the ice cream I loosely followed this recipe (without the pecan topping). Are you part of a “Dinner Club” as well? How does yours work? I’d love to hear the details in the comments! Slice the apples into thin 1" pieces. I do this by using an apple slicer and then cutting each slice two more times (both longways and crossways). Toss the apples in a medium sized bowl with the cinnamon, butter, and honey. To make the honey slide right out of the tablespoon (as opposed to sticking) measure out the melted butter first. 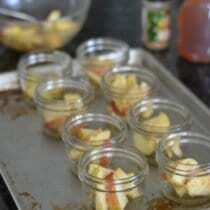 Evenly divide the apple mixture into 8 half-pint jars (or together in one pie plate if using). Place the jars on a large baking sheet. In the same mixing bowl combine the crumble ingredients including the oats, flour, walnuts, melted butter, honey, and salt. Evenly divide the mixture over top the seasoned apples in the jars. Cover the jars with one large piece of foil and bake for 25 minutes. Remove the foil, turn the oven up to broil, and cook for 2 to 3 minutes longer or until the topping turns a light golden brown. Serve with homemade vanilla ice cream (if desired) and enjoy! Special equipment needed: 8 half-pint jars. Alternatively this dish can be baked together in one round pie plate. *To make this recipe Peanut/Tree Nut Free, omit the walnuts/pine nuts from the crumble topping. Any suggestion on substituting the wheat flour?? I am GF. Thanks! Agave for honey, and almond flour for wheat sub! I wonder this a lot, but I’m curious what you would use as a honey substitute. I’m allergic, so honey is out, but I always see this delicious recipes and get jealous! I know maple syrup can be used in equal amounts, but would it change the taste of these a lot? I think pure maple syrup would be a great substitute or you could also use sugar of course! If the maple syrup changes the flavor, I would think it would be in a good way :-). Or how about agave syrup? I love this idea and recipe. I am thinking about making it for Thanksgiving…but I have a relative with a severe dairy allergy. Do you have any suggestions for a non-dairy replacement to the butter? this is all I can see that would effect her. PS I love your blog. I am a director for a daycare and am slowly trying to convert to more of your recipes(and recipes like yours) and less processed food. I just have to get the cook more on board! I also have a dairy allergy and you could sub coconut oil or whole foods carries spectrum brand non hydrogenated shorting that just contains palm oil. I would probably use either of those depending on why you have on hand. Coconut oil would work as a substitute for the butter. I think I will make these for Thanksgiving as well but will substitute the flour with almond flour as my son has Celiac. It will be nice knowing there will definitely be a dessert he can have with no worries. Thanks for the idea! I am so glad you are enjoying the blog and I agree with Tiera and Anna about trying coconut oils as a substitute. Good luck! 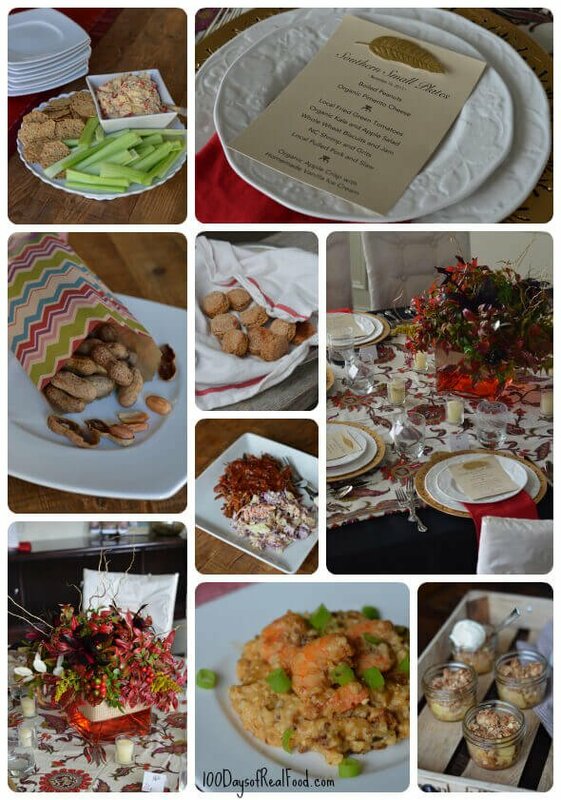 I started a supper club (ladies only) and we are now into our 3rd year. We meet about every 6 weeks on a Saturday night and occasionally do a “night out” together. We choose a loose theme for the year. Each host makes a complete dinner around the theme and another member brings the dessert. Our themes have been pick a single chef (Julia Child, Nigella, etc), a place with some significance in your life (India, Russia, New Mexico) and this year it is choose an unlikely celebrity chef cookbook. There are some funny ones out there! I love it – so glad your group sounds like it’s still going strong! Finally a dessert that my husband will approve of! He feels eating healthy means excluding all sweets but this with it’s smaller portion should please him! I’m so excited to find this recipe on your website today! I was just searching the internet last night looking for a “clean” apple crisp to use up some honeycrisp apples! So excited to try this, all of your recipes are fantastic Lisa, I trust everyone of yours I try! Thanks so much for this recipe and so many others! I am wondering if you have substitutes for Ranch dip mix, onion soup mix and a can of mushroom soup??? Are the jars mini mason jars? They can go in oven safely? Yes, jars are designed for “canning,” which involves being boiled at high temperatures in order to “process” the food. Would you just adjust the cooking time if using dried apples, do you think? Thanks for the cute apple dessert idea. I can’t wait to make it for my family! I also am wondering about the jars. Are they special oven safe jars? And where did you get them? Thanks! Just wondering if you can make these up the night before n keep them in the fridge until you are ready to put them in oven…or will it become soggy? My husband and I are in a Dinner Club with two other couples, we’ve been doing it for over 6 years now! We do it once a month (sometimes every other month, we’re flexible) and go to one of the couple’s houses. That couple makes dinner, one couple brings the app and a game, and the last couple brings wine and beer. So much fun, and we’ve almost never had a bad meal! I love the idea of bringing a game – sounds fun! We have a dinner club called Eat Drink and Be Merry, the inspiration of a friend of ours. Six of us girls get together every month or two, for the past three years or so, and the host chooses the theme for each. Our themes have included: Tapas, Fusion (of two cooking cultures), Homemade Sushi (with chef to teach us), and we hope to do a Localvore when the season allows. One EDBM I brought a nicoise salad in jars similar to those in this recipe – has turned out to be one of our favorite get-togethers! Will make these for Thanksgiving, Do you think they could be made the night before? These sound delicious! Just wondering how I could make it nut free? Just leave them out? Should I add more of something else? I would just leave them out or try sunflower seeds (or pumpkin seeds) instead. I’m not part of a dinner club, nor am I sure how it works, but it is definitely something I will research and look I to. I love cooking through your recipes and cant wait for the cookbook to come out in a couple months!!! I’ve been looking for an apple crisp recipe and it’s like you read my mind- thank you! I’ve tried many of your recipes and they always turn out delicious, so I can’t wait to try this one, too. My friends and I used to host a dinner club every month or so and the hosts would choose a different culture and everyone would bring dishes from that culture. For example, my husband and I hosted the French night, and now I know why French people are so skinny- French food is so rich and delicious that you can’t eat more than a few bites! :-) Another couple hosted a Polynesian night and we roasted a pig! So fun! Happy Thanksgiving to you and your family. I hope it’s a wonderful one! Hi Lisa, I ended up leaving out the nuts & just used 1 full cup of oats. It turned out delicious! We also added homemade whip cream on top – yum! Thank you for another wonderful recipe. PS – I couldn’t rate the recipe on my phone, but I give it 5 stars! but have a little trouble with the topping. Mold food allergy counts out maple, butter and I find the honey rather sweet. I have never used agave and it is very expensive to buy just to try. What is it and is it sweeter tasting than honey? All of the recipes you post look so delicious. I usually stick to a Mediterranean diet but I am tempted to try many of these! Thanks for sharing! I only have the more narrow slightly taller looking 1/2 pint jars. Do you think they will work as well. Just would be silly to buy more when I have so many. This recipe looks delish. Can I use steel cut oats instead of rolled oats? I love reading your website and trying your recipe ideas! This one inspired me to make into a pie for Thanksgiving. I haven’t tried it yet, but I know it’s going to be a fabulous hit! Thank you for your courage and inspiration! Do you think I could substitute maple sugar instead of honey? We are out of honey . Sounds yummy on this cold, snowy day! Sorry meant to say maple syrup not sugar . Thanks! Yes, it was delicious! My one year old loved it too! Thanks for all of your tasty, wholesome recipes! Made these for dessert last night. They were delicious! 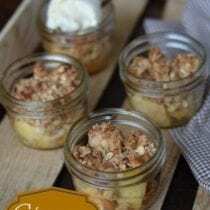 I’m a big apple crisp fan, and these did not disappoint! Loved it! I made it in a pie dish. I only had one apple so I substituted a pear for the other…yummy! Thanks for the recipe! Hi I am going to try to make this and i’m using a pie pan. do I have to cover the pie pan with foil like it says to do with the jars or do I leave it uncovered while baking for the 25 minutes? This looks yummy! Can they be frozen after baking? I would love to keep these handy for a quick breakfast when pressed for time. Thank you! I can’t do nuts, do you think I should add more oats to compensate or just omit them? I just love this recipe. Made it again tonight. Delicious! I have a cherry tree that is loaded, so I decided to make this using cherries. Delish! I may use almond flour next time since it is a good flavor mate with cherries. I feel like I’m making one of your recipes every night. I have your whole wheat pizza in the fridge now but I made this cinnamon apple crisp last night and it got rave reviews from my husband. I love it too. I want to make something similar to this for a picnic bachelorette lunch. How long do you think the filling will keep if I make it ahead of time? Do you think it would still taste good cold since we won’t be able to bake it right before serving? Loved the recipe. You should add a yummly share button. I’d like to save this to my yummly recipe box! I love that your baking sheet looks like mine. It looks like someone actually “COOKS”with it. By that way, I’ve been spreading the word and sharing your cookbook and have sold a few for you. Want to hire me for your assistant in this area? Love the jars, I was just thinking that I could pop a lid on these and send them to school with the kiddos for a special treat. I wonder if they would freeze well? So here’s the problem with this recipe: I just made it, don’t have 7 people to share it with, and I can’t stop eating it! Good, but the topping didn’t get crispy. It was just very crumbley and dry. I might try again with cold butter. In the old days I had a really good apple crisp recipe. I needed to make it more Real Food friendly for my new style of eating. Your site was a go to place for updating my recipe. I had peaches I needed to use, and I thought they would work as well as the apples. I did make one change to your recipe (besides peaches), I had seen another recipe with peaches and they used Chinese Five Spice instead of the Cinnamon. It came out great! I searched high and low for a clean apple pie recipe that suited my family. I never found one so I finally took a few recipes merged them together and cleaned them up. I used your crumb topping instead of a top crust. The results are amazing. It is the best pie I have ever eaten clean or not. It was your topping that pushed it over the edge into heavenly. I am also looking for a clean eating apple pie recipe! Please share Alaina! If I use granola to top it do I still bake it for the same time? Do you store leftovers in fridge or just on counter?? Hi Jennifer. I’d put them in the fridge. Can I omit the flour to make this recipe gluten-free? Or at least substitute it with something else you recommend? Hi there. Subbing with a gluten free blend should work. That was a terrific dessert! Well we sort of cheated and had it as a side dish. Delicious, quick, easy, tasty, everything you could want in a dessert. This was very good. I have been enjoying many of your recipes, and we had some friends over for dinner last night. I made them this dessert because I realized I had forgotten dessert, and I only had a few minutes to throw something together. This was so quick and tasty! I knew I could trust one of your recipes to come through for me, and it did! Did I mention this was super, super easy?!?! I looked at the Cinnamon Hill website and I was wondering if you also grate your own nutmeg, clove, and ginger. I’m just getting into spices and need some guidance. Made this last night for a sweet treat after dinner and was pleasantly surprised at how delicious it was!! I love that is calls for honey instead of sugar. You’re totally right it doesn’t need the sugar at all. thanks for a great recipe! Did you have any problems with the glass when you broiled the dessert? I’m always worried about such high direct heat on glass — even canning jars, which are supposed to be used in boiling water. Nobody had any problem with this? Has anyone tried freezing these either before or after cooking? Hi. Yep, after cooking works well. Delicious! I’ve made this multiple times since I came across it and it always turns out great. I usually make it in a glass dish or metal one since I don’t have glass jars. We made this today in a 9×13 pan because I don’t have little jars. It’s ok. I love that it’s not overly sweet so it works for a breakfast for the kids, but we had a terrible time getting the crumb topping all moist. I ended up needing quite a bit more butter because it had cooked, dry flour on top at the end. Please to do NOT bake things in jars unless they are specifically labeled as oven safe! Ball jars are NOT oven safe, per the manufacturer. could you make this recipe modified for peaches instead of apples? Peaches are in season for the summer! Hello Katie. If you try it, let us know how it goes. I made it with peaches last week, and it was incredible. I used 3 peaches because peaches a re typically smaller than a large apple and have a bigger pit. Made all in one pan. I’m actually trying it in my crock pot right now because I have seen a lot of crumbles and crisps done this way online. I only used two peaches and about 1/2-2/3s of the topping because I find that I don’t use as much in a single pan. We’ll see how it goes, although I am anticipating less crispy. Can you buy local organic apples? They are on the dirty dozen list. Hi there. We can, seasonally. Otherwise, we can find them in our grocery stores. Can these be frozen? If so-before or after baking? Hi Kara. I have frozen them after baking. Can u use coconut oil instead of butter? Hi. I want to try this recipe as gifts for my other teachers in the social studies pod. I want to have instructions on a little gift tag….What is best for reheating? Hi. I cover lightly with foil and reheat at 350 until heated through approximately 8 minutes assuming they are thawed. Can this be prepped ahead or will the apples turn brown? It can. The apples might brown a little but it is not noticeable once cooked. Made this today for Christmas dessert! Prepped it a few hours in advance and let it sit with the foil on top for a few hours, and still came out great :) This lighter, healthier dessert was so delicious and perfect after a heavier Christmas dinner. Could this be “canned” to have on the shelves for later?